The natural world around us is a diverse place that has stood the test of time because of its resilience. I can’t help but raise the question of why our cities aren’t more resilient? In the past, many cities have struggled to attract people to their core, a trend that has been ongoing for decades. However, in recent years some cities have garnered increased interest. As baby boomers retire and look to downsize and millennials continue with their desire for a more easily accessible lifestyle, urban cores are reemerging as desirable places. People now want to know why barriers like railroads and highways must only be used for singular purposes? As a recent edition of Landscape Architecture Magazine (February 2017) called it, “Found Ground” is spreading across America and seems to have no end in sight (the Special Feature Section: Over & Under – pages 74-159 contains many good articles). To be clear, this is not a new idea. Freeway Park in Seattle, Washington was constructed in 1976 as a direct response to the neglect that followed the construction of Interstate 5. It not only bisected the city, but greatly limited peoples direct access to downtown and residents wanted their easy access back. Like the situation in Seattle, Akron, Ohio freeways sliced and diced the urban fabric separating and segregating Akronites not only from each other, but from the urban core. As we look to reenergize this core, one can’t help but imagine what Akron could look like in the coming years. 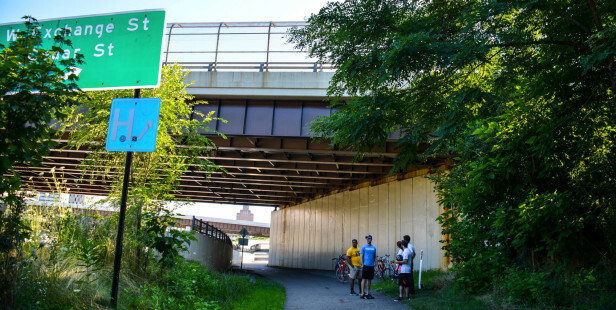 Critical mass in Akron has already begun in the form of the iTowpath, Reimagining the Civic Commons and the redevelopment of State Route 59 (SR-59). While assisting with the iTowpath underpass enhancements, I imagined how Akron might look with parks or “peopleways” covering portions of the highways. 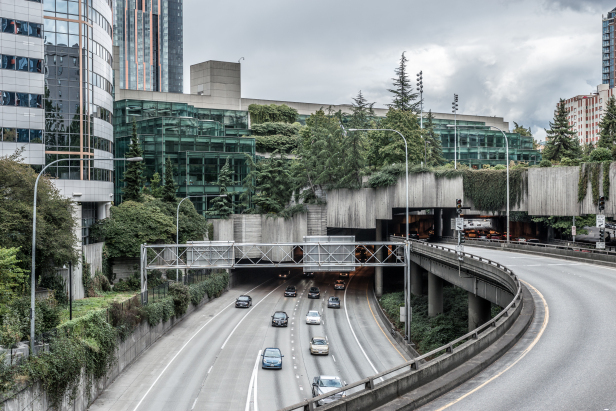 Freeway park was the first overpass park which helped redefine how people outside a vehicle interact with highways. There they were not only directly connected, but invited to linger as one would do in another park. And as part of the early planning stages of the iTowpath underpass enhancements, I was immediately drawn to the SR-59 overpass at Thornton. It reminded me of a cathedral. It is a very utilitarian space, but the vaulted ceiling provides a sense of enclosure, like being in a room. The feeling is different from being in a forest – it is uniquely urban, and the bones are there for something very engaging and dynamic to be created. It is perfectly situated along the Towpath, a National Heritage Corridor, and two large neighborhoods chopped up by SR-59 and interstate 76 and 77. It is amazing how close you are to downtown, yet feel so far away with a lack of connectivity. With intriguing concepts like “pop-up parks,” “pop-up dining,” and “pop-up boutique shopping” now in the picture, the innovative use of space will only further spur economic development as well as reconnect neighborhoods’ long divide. 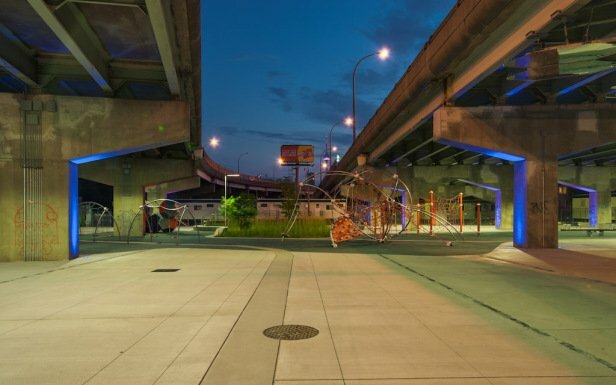 Don’t just look at existing infrastructure as an opportunity – maybe the answer lies in bridging the gap with something similar to what Freeway Park did so many years ago, or Toronto’s Underpass Park has done more recently. What’s your next move to help make your city resilient? Underpass Art Parks in Washington, D.C.